The Pergamon Materials series presents texts that satisfy one of two criteria: the systematic presentation of a specialised but important topic within materials science or engineering that has not previously (or recently) been the subject of full-length treatment and is in rapid development; or the systematic account of a broad theme in materials science or engineering. The main (but not exclusive) audience is intended to be at graduate level. For more information about the series or for details of how to submit a book proposal, please contact the Series Editors, Lindsay Greer at alg13@cam.ac.uk and Ke Lu at lu@imr.ac.cn, or the Acquisitions Editor, Susan Dennis at susan.dennis@elsevier.com. In Nucleation in Condensed Matter, key theoretical models for nucleation are developed and experimental data are used to discuss their range of validity. 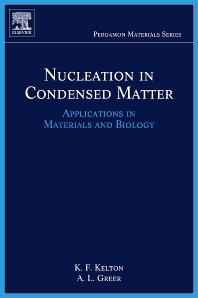 A central aim of this book is to enable the reader, when faced with a phenomenon in which nucleation appears to play a role, to determine whether nucleation is indeed important and to develop a quantitative and predictive description of the nucleation behavior. The third section of the book examines nucleation processes in practical situations, ranging from solid state precipitation to nucleation in biological systems to nucleation in food and drink. Nucleation in Condensed Matter is a key reference for an advanced materials course in phase transformations. It is also an essential reference for researchers in the field.